It’s state night again and believe it or not, we’re done featuring all of our deliciousness from Maine. While we’re sad to see it go, we’re excited to press on with some new stateside adventures. 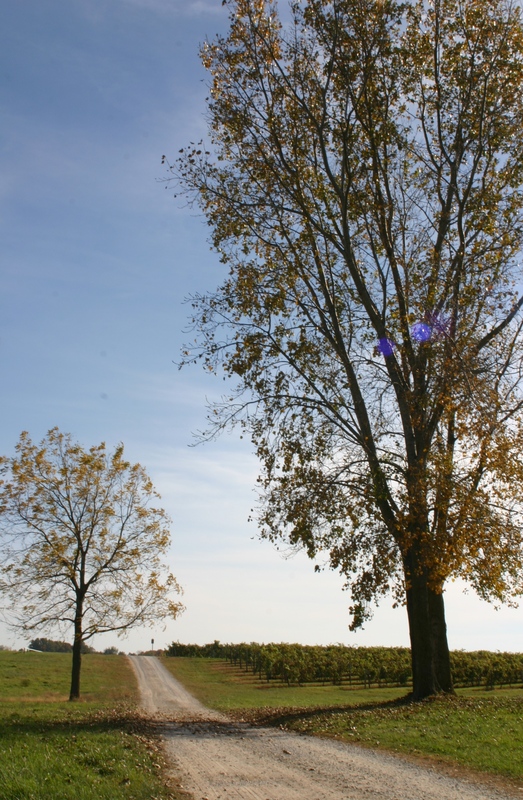 In this post we will however be revisiting another state – Michigan. Only this time we’re not cooking with cherries, rather we’re going with some juicy Michigan blueberries (not to be confused with Maine blueberries😉 ) and peaches. 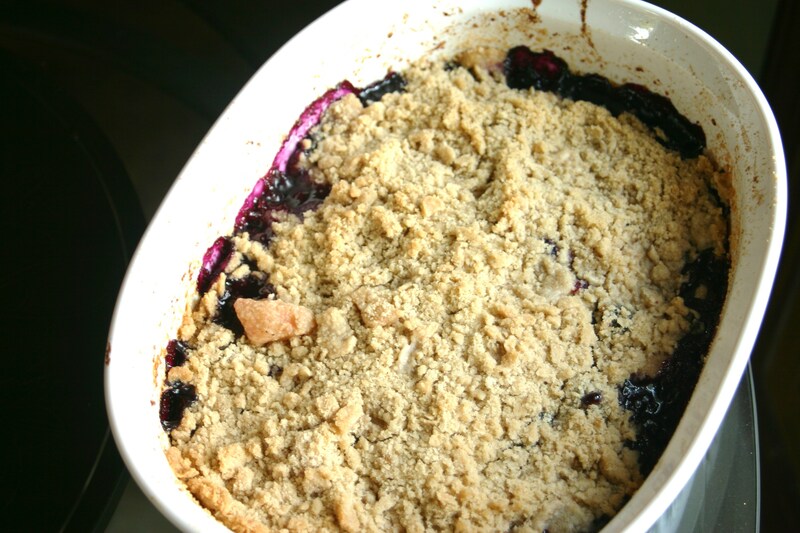 My mom and dad recently enjoyed a weekend getaway to the Traverse City area of Michigan, and when they came back my dad made a delicious blueberry and peach cobbler. My dad doesn’t bake often, but when he does you know it’s going to be something good (and usually something terribly caloric). Peach cobblers, banana breads and my birthday cake (which I’m looking forward to next week!) are some of his specialties. Dad found this particular recipe in a magazine while they were away. It’s not a surprise that it caught his eye. And since we enjoyed it so much, we brought the idea home and put our own twist on it. We first made a visit to our farmer’s market to grab up some Michigan peaches and blueberries, the we got to work making our Blueberry-Peach Crisp. 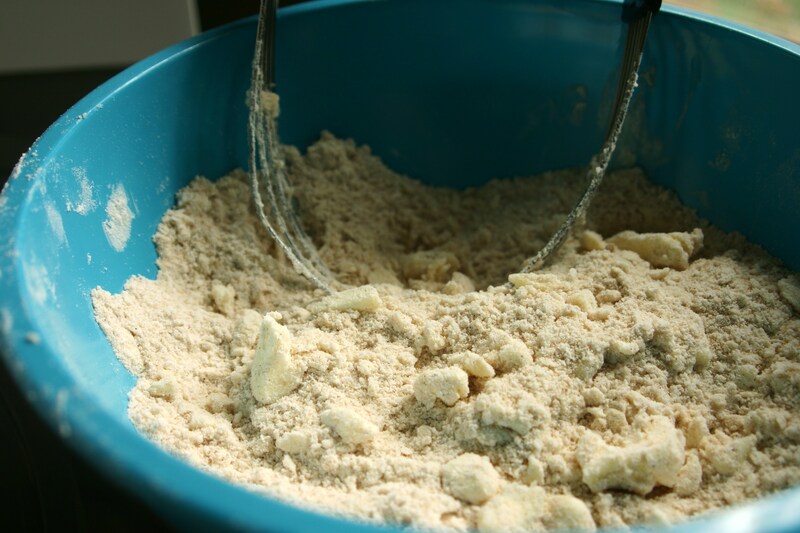 We started by preparing the streusel topping, a crumbly mixture of flour, butter, brown sugar, cinnamon, nutmeg and a bit of salt. Then we mixed together the blueberries, chopped peaches, vanilla and sugar. We added the fruit to a greased baking dish and sprinkled with a little extra flour to prevent the juices from turning overly runny, and topped it with the streusel. We baked the fruit crisp at 375F for 45 minutes and it came out perfectly bubbly and browned. Yum! The color of this cobbler just makes me happy and it screams early fall to me. Soon the house will be filled with the smells of apples, sage and pumpkin, but for now we’re enjoying the last of the summer fruits. I’m totally not surprised that this was a 4-spooner. Yum!! I would love a scoop right now for breakfast with a little milk on top. I think Mr N. had it just right. 🙂 Your crisp is GORGEOUS…the oozing blueberries are making my mouth water and my stomach grumble. Have a wonderful Sunday! 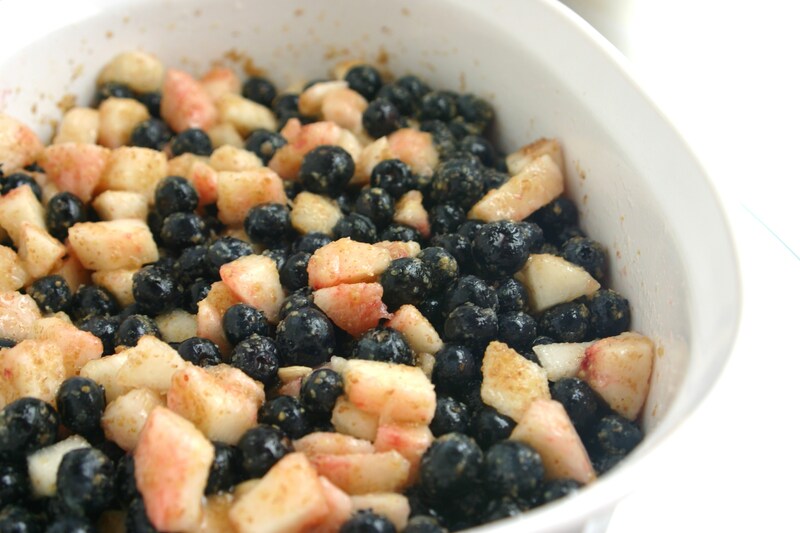 I love the mix of fruits in this crisp, superb recipe! Bah, more blueberries? I’m convinced you’re just posting them to mock me now! 😀 The next time I see blueberries in my local store I’ll buy some and take a photo so you can have a good chuckle at the pitiful excuses we get dished out here! Fabulous looking dessert – as always – really crisp and warming 😀 By the way – I wondered for a while, does your “family food grading system” only go up to 4 spoons, as in 4 spoons being the ultimate in uber-awesomeness? LOL! Don’t worry…I think this is the last of the blueberries for a while. 😉 Yep, our spoon ratings only go up to four spoons which is uber-awesomeness. 🙂 I added a spoon explanation in the side bar that gives a bit more of an explanation. I didn’t even know that Michigan is known for their blueberries. 🙂 This looks amazing, though – wish I had some right now! dfurlan reblogged this on Livingston Inn Madison and commented: Such a fantastic blog with interesting themes and ideas while recognizing the “seasons” of cooking and baking. I think your dad found a winning recipe, this looks divine Kristy! Peaches and blueberries make for a great combo. Can’t wait to see the cake your dad whips up for your birthday. Guess I’ll have to wait, again. 😉 And desserts aren’t really desserts unless there’s tons of calories and sugar! I love a streusel topping, this crisp looks wonderful. Thanks for sharing this appropriate autumn dessert! This would make me very happy! And for breakfast too! In fact I love fruit based desserts that are light in sugar for breakfast! I feel that way I can burn off the calories all day long!! does anyone know the difference? 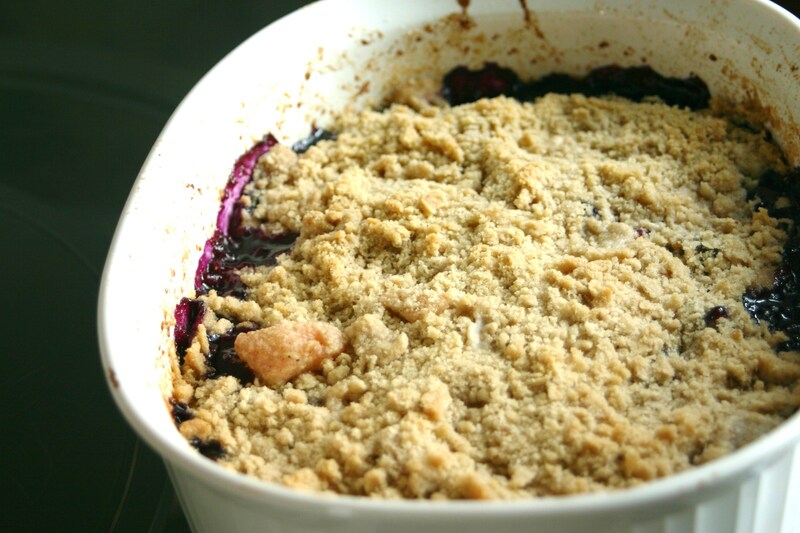 crisp, crumble, cobbler, …. • Crumble – A crumble is probably the most familiar to most of us. It’s simply fresh fruit with a streusel-like topping that gets baked until the fruit is cooked. 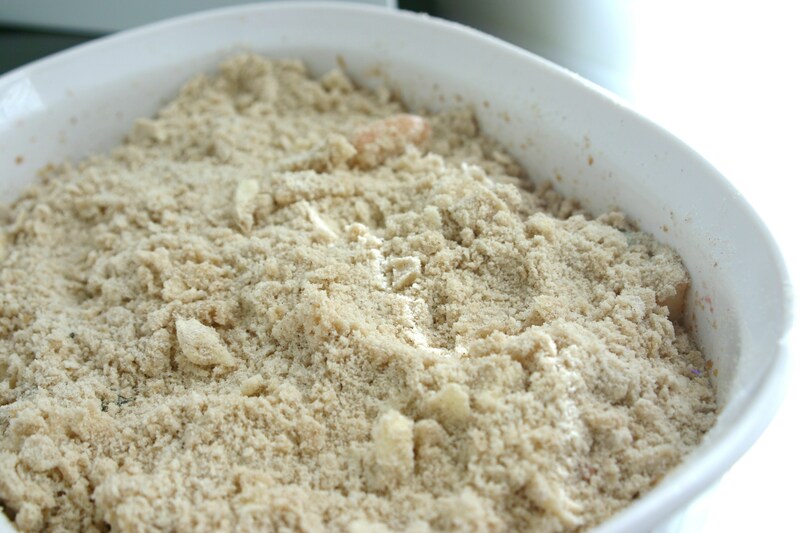 The streusel is usually a simple mix of oatmeal, brown sugar, butter, and spices. An actual crisp, as in apple crisp or strawberry crisp, is the same idea but with no oats in the topping. This makes the topping more like a crumbled cookie or pie crust. 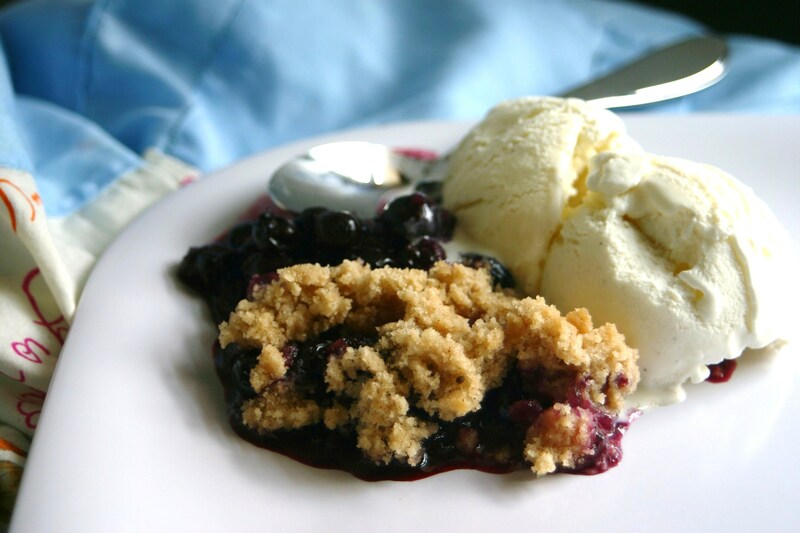 • Cobbler – Cobblers add a biscuit topping to the fresh fruit. The biscuits are usually dropped onto the fruit in small rounds, giving it the appearance of a cobbled road and hence the name. Cobblers can also be made with cake batter or cookie dough instead of biscuit and are equally tasty. Oh, this looks so delicious Kristy – I love that your dad brought the recipe to your attention… blueberry and peach smothered in the goodness of fall… hard to beat. Your topping is golden gorgeous. (I love that the ice cream is twice the size of the crisp in the last photo :)) So you’re a soon-to-be birthday girl… who is cooking for mom on the big day? Yay for your dad finding this recipe! Looks superb. this looks like the perfect end of summer, transition to fall dessert. sounds delicious! Just last week, friends brought me a blackberry & peach cobbler. It was wonderful served with ice cream and I imagine your crisp was, too. I love this time of the year! Ooooh! Blackberry and peach cobbler? That sounds heavenly! I’m with you – this time of year rocks! It looks wonderful. Look forward to the rest of the menu. Thanks! This was it for our Michigan tour this week. 🙂 We do have a few more Ecuadorian delights coming though.